It looks like more pain for California's taxpayers, as CALPERS will reduce the return assumption on its state employee pension plan. The lower the assumed return, the higher the annual contribution needed from employees and taxpayers to pay out retirees. Calpers is considering whether to reduce the projected rate of return used by the giant pension fund to make investment decisions. A cut could force cash-strapped governments in California to pay millions more each year to cover their employee pension obligations. Since 2003, the California Public Employees' Retirement System has assumed that the value of its stocks, bonds and other holdings would increase by 7.75% a year. But the likelihood of an extended period of modest economic growth world-wide is fueling doubts inside Calpers that the pension fund can continue aiming so high. Pressure to lower the target has been building for months. "You'll be lucky to get 6% on your portfolios, maybe 5%," BlackRock Inc. Chairman and Chief Executive Laurence Fink told Calpers board members last July. 7.75% is far too high. 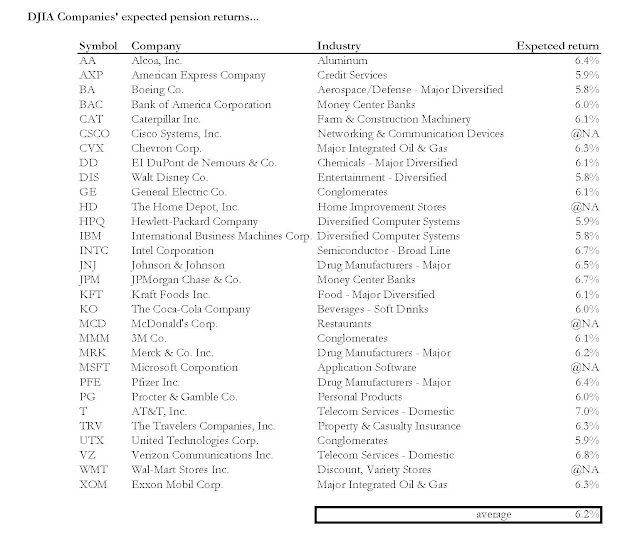 CALPERS need look only as far as the publicly traded members of the Dow Jones Industrial Average, who must be more accurate in their pension return assumptions. They have expected returns around 6.2%.